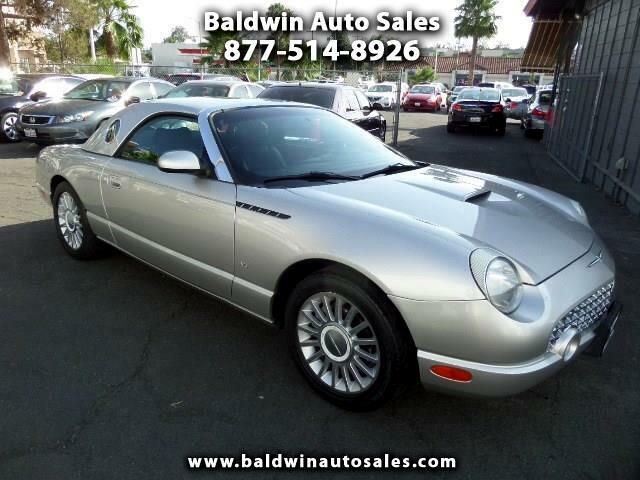 WARRANTY LOADED LEATHER HEATED EATS HARD TOP ALL ORIGINAL ALL RECORDS AUTO 2 KEYS ABS DUAL P SEATS TURN KEY AND GO ENJOY MODERN DAY CLASSIC DREAM CAR BRILLIANT SILVER BLACK INTERIOR This T-Bird has been a pride-of-ownership vehicle and very well cared for. Beautiful paint, body, and interior is all original. Comes included with the hardtop and power canvas like new convertible top. Must see this one to believe the condition. Best price anywhere in the country for this condition and well below KBB and the market. Totally turn key and go. Keyless entry, auto climate control, cd changer in dash, alloys, alarm, and stunning show car looks. 89k miles. A 5year/100k mile additional service contract is available and can be used at any Ford dealer nationwide. A great opportunity for anyone looking for this classic.